The Alaskan raised Stack brothers saw a need for specialized services in heating, plumbing and video inspection. With ties to the heating, plumbing and utility services of Fairbanks, they used their combined knowledge to form Stack Company, Inc. in 1994. They were the first and only local company to offer small diameter pipe video inspections. By that time operations were based out of the shop on Beechcraft Avenue. 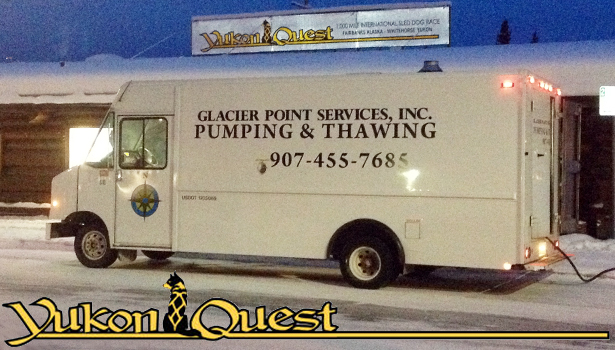 Glacier Point Pumping and Thawing LLC was formed in 1999 with the purchase of their first septic pumper truck. In 2009 the first vehicle dedicated to steam thawing was put on the road. Major expansion to the shop was completed in 2012 with a 5000 square foot garage and shop. In February 2013, Stack Company Inc and Glacier Point Pumping and Thawing LLC were officially folded into the combined company of Glacier Point Services Inc.
Glacier Point Services, Inc. is a proud supporter of the Fairbanks Community! We are an annual bib/banner sponsor of the Yukon Quest, KUAC’s Red Green Regatta and various other local sports and organizations.